Christian Lacroix evening gown. Orange silk faille, orange silk satin, rhinestones. Spring 2005. I’m usually not a big fan of orange, unless it’s an Hermès box, then I like it very much, but I thought this Christian Lacroix orange evening gown from 2005 was a showstopper. It is currently on display at The Museum at FIT, as part of the exhibit The Great Designers, Part One. 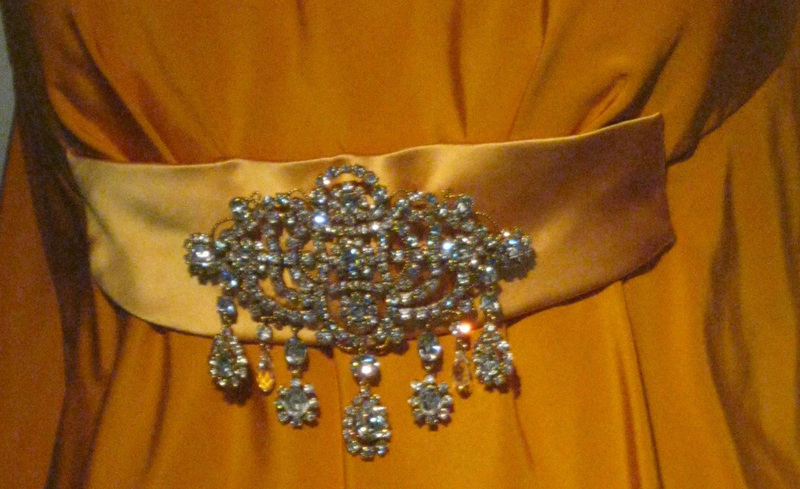 A closeup of the Lacroix gown. Christian Lacroix closed down his haute couture line in 2009, and his name is no longer his own—it has become the stamp a licensing company uses for eyewear, stationery, home décor, and menswear—but in October Paris Opera Ballet opened La Source, which featured costumes by the designer himself. The Great Designers, Part One is on view until May 8, 2012. I adore Christian Lacroix so much, and I was sad to see him go. Thank you for the present of this fabulous dress. 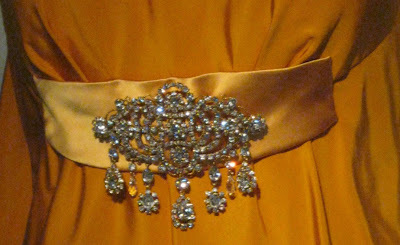 So gorgeous - I could see Jackie Kennedy entering the ballroom in this gown. I would wear this gown in a hearbeat--the world needs more orange! Thanks for the info on Lacroix--I thought it was still operating! I have a funny story about Christian Lacroix, sequins and a gay nightclub in Paris - will have to do a post - I read that he found the fashionable world unbearable by the end of his time there, and when you look at how it all ended for John Galliano you do wonder about the stress these guys have to work under. A very nice orange-tone and material!